The Baird institute is committed to the education of doctors and nurses in the field of cardiothoracic medicine and as such, recently funded six nurses to attend the 8th Annual Cardiothoracic seminar in Newcastle. The conference was aimed specifically at nurses and allied health professionals. 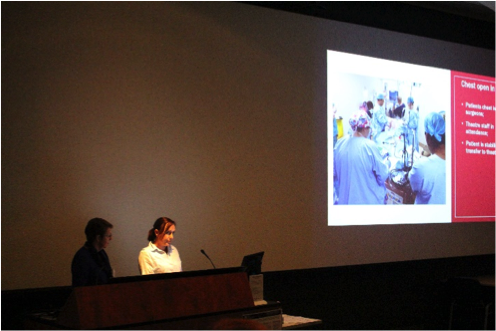 I am the Clinical Nurse Educator of ward 6E2, the cardiovascular ward at RPAH, and I was extremely impressed with the quality of this seminar as the content was extremely applicable to the care we provide to our patients on a day to day basis. Education in nursing care is very often reactive in nature, waiting for a complication to occur for an opportunity to educate on the management & treatment. I feel this seminar provided my nurses and I with the knowledge to be adequately prepared for any complications post-operatively which would directly impact on our patient’s journey. The presentation regarding sternal wound dehiscence is extremely applicable to my role on the ward, and is an area I have a special interest in. It was extremely beneficial to follow the patient journey post pec flap advancement surgery and see the wound’s journey via photographs. The topic of tamponade was also extremely valuable as it is a complication which occurs to our patients every so often and which requires preparation and knowledge of the signs and symptoms, as well as the treatment options, to manage adequately. Finally, the presentation on post-operative arrhythmias was perhaps the most pertinent topic as it is managed by myself and my nurses on a daily basis. I believe it reinforced our prior knowledge whilst also adding to it. All up, it was an excellent opportunity for my staff and I and I really appreciate the opportunity that the Baird Institute gave each of us to attend. 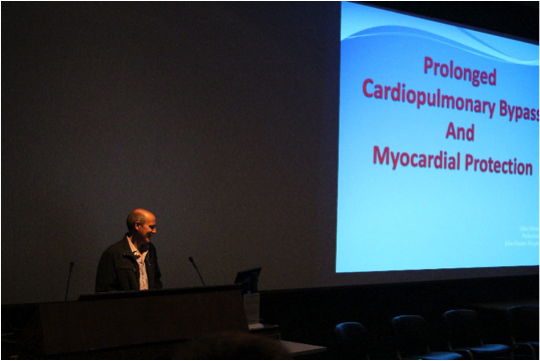 One of the presentations at the seminar was “Prolonged Bypass – Myocardial Protection” by Perfusionist, John Dittmer. Below is a summary of John’s presentation. Cardiac surgery remains unique in that most procedures require Cardiopulmonary Bypass (CPB) to allow the surgeon to operate on a motionless and relatively bloodless heart. Cardiopulmonary Bypass is the most invasive procedure performed on the human body and unfortunately it is not without its consequences. Each time the blood passes through the bypass circuit it passes over between 2 and 3 square meters of non-endothelial surfaces. As the blood traverses the circuit, it is subject to rapidly changing pressures, sheer forces and comes in contact with foreign surfaces and with air. The blood is therefore subject to various stresses not normally experienced within the body. The longer the patient is on CPB there is an increased likelihood that its effect on the blood and the inflammatory response will cause coagulopathies and increased vascular permeability. Reducing the effects of CPB will bring about better outcomes for our patients. This requires a team effort. Already this year there are positive results from changes in our practice. Firstly, using the results of anaemia screening, patients have a higher pre op Hb. This has reduced the volume of hemodilution during bypass. Secondly there has been a reduction of the use of blood product used intraoperatively. This has been done by determining which products are needed by analysing the patients clotting profile, using the TEG monitor. During cardiac procedure, the heart is stopped by giving Cardioplegia directly into the coronary arteries and or coronary sinus. There are several techniques involved in preserving the heart for longer cases. We have been using three different types of Cardioplegia and are undertaking a small study to look at the efficacy of each formula.